"The Second Coming" - Chapter Two: "Things Fall Apart"
In a meeting room at the Hall of Justice Zatanna, Black Canary and Vixen discuss Vixen's recent problems with her abilities. When Zatanna performs a mystic search to find the source of her troubles a powerful force resists her efforts. Meanwhile in the Auxiliary Robotics Lab John Henry Irons regains consciousness and helps Batman do the same. The Dark Knight sends out the emergency call as Superman engages Amazo in battle. The rest of the League soon joins him but Amazo manages to fight back and goes so far as to separate Firestorm into the two people that make up the nuclear hero. The League rallies back, but while they make some headway the android manages to escape. 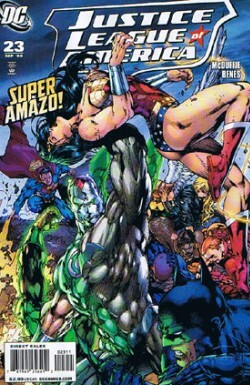 The League mounts a search but Amazo is the one that finds the League and the battle commences once again. Vixen tries to steal his abilities but fails and Amazo raises his arrows in the air in preparation of the killing blow. Story - 4: You know it's funny. In writing the synopsis of this issue I began with the words, "at the Hall of Justice." I wrote those words and immediately heard the voice of the narrator from the various Super Friends series, which was neat and kind of scary at the same time. It hit me about halfway through this issue that the vibe I am getting from this storyline is a ramped up, modern day version of the old satellite era issues, especially the ones written by Gerry Conway in the late seventies and early eighties. This is not a criticism as it would be in other books. McDuffie is making this title exciting again and the all new, all different Amazo is a good example of that. As is usually the case with McDuffie's writing the characters grab me more than the plot. It was great seeing John Henry Irons doing something useful again. John Henry is a great character that has been around for fifteen years now and while 52 did a lot of great things for him the follow-up was INFINITY, INC, which is pretty awful in all respects. It was nice to see the rest of the League getting into the action further and McDuffie not only used Amazo's abilities in a rather clever manner but the way the League took him on was a lot of fun as well and I think that's why I enjoyed this issue as much as I did. I am still on the fence about the Vixen sub-plot. It is nothing against McDuffie or the character really because I like Vixen just fine. It's just I don't know if Vixen having messed up powers is something to really get excited about. We'll see how that goes. So this was another solid issue. McDuffie definitely has this book back on track and I look forward to the conclusion of the current Amazo/Red Tornado arc. This was two issues in a row that I was happy with this title, which is a good feeling. A good feeling indeed. Art - 4: It seems that every month that Ed Benes draws an issue of this title the same things happen; I like the art but something ends up bugging the crud out of me. In this issue we were given a redesigned Amazo, which was visually striking. It's like a cross between the old school Amazo and the one featured on the Justice League animated series. The fights, as always, were well handled. The cheesecake was taken down a notch too, which I liked in a bizarre way. Holy crud on a stick I am sick of the "Superman gets angry so his eyes glow red" shtick. I got tired of it when Jim Lee drew the character and I really got sick of it when Benes drew SUPERMAN. It is just so overdone. Please. Stop with the red eyes. For me. Cover Art - 4: As previously mentioned I really dig the new look for Amazo and this cover showcases it well. This is a powerful cover, but it is also the second one in a row with characters lying around in a heap. Still, no real complaints here this month, which was nice.